6 foot tall fences, elk and private hunting parties? I dont know what they call that here in Montana, but back in Texas, we called it "Game Ranching". MP3 Audio Jan. 28, 2014 Elk Brucellosis local "work group" meeting at the Livingston Library. Druska Kinkie opens with statement that calving will be busy, they will not be able to come up for air until probably June, so this will be the last meeting. She mentions the current tools available in the 2014 Elk Work Plan. MSU Extension Facilitator Mary Ann Keyes introduces the meeting and the agenda. 4:00 – FWP Quentin Kujula reviewed the FWP Commission process and the Working Groups product being applied to that process, which is modifying the 2014 Work Plan. He explains the Commission will hear the proposals and do with it what the will. So theres an introduction, public comment period and final by commission. I am inserting the final recommendation version being submitted to the Commission , so that you can follow the process and see the final product, which has been changed from what was last discussed at the Work Group meeting. BTW, remember that all this is outside Game Damage and has no requirement for public hunter access during the general season for any of these actions that sporstmen are paying for! Paradise Valley. Some form of lethal removal may be necessary to prevent commingling/disease transmission during this time period. Livestock producers who desire to prevent elk from commingling with cattle on private property and DNRC lands must have tools available. When hazing becomes ineffective, forms of lethal removal should include both the EMRs and kill permits. 18:21 - “Elk calving must be prevented from creating new calving grounds along the river bottom.” Art Burns wanted, “...along the valley floor,” added. Discussion of historical/traditional elk calving grounds. Discussion of migratory and resident elk herds. FWP Karen Loveless pointing out that people might object to their efforts of dealing with elk in the whole valley, suggested they focus on terminology that involved their cattle operations. FWP Quentin Kujula, “I think gut pile management is certainly a good point. Gut pile management is embedded in the Work Plan already (gut piles were not managed last spring). Quentin Kujula then tries to redirect the discussion. 59:00 – They voted on this recommendation going to the FWP Commission in February. Majority voted yes. described in a plan developed by the property owner(s) and/or their designee(s) in conjunction with Montana Fish, Wildlife & Parks. C) Montana Fish, Wildlife & Parks should include fence modification (e.g., MSU Extension MontGuide 2014) as a method of fencing appropriate to minimize brucellosis transmission in the Paradise Valley DSA and should be responsible for the cost of materials, as in the existing game damage process. Large scale pasture fencing and gates, tall enough to keep elk out for the months they didnt want them there, but able to drop down or add gates for when they did (perhaps hunting season?). At the Dec. 18th meeting, Rep. Alan Redfield gave the example of his fencing, he has 160 acres of hay meadow, all fenced off, about $5,000 a mile, 6 ft. high, 5 wire electric fence, 9,000 volts because of the hollow hair on them (elk). The MSU representative mentioned $1500.00 a mile for materials, to modify existing fences. Again several members bring up fencing for the whole year, around irrigation pivots, etc, and have to be reminded, this is supposed to be about the brucellosis risk transmission period, which they are stating is Jan.-June. 1:16:15 – Jim Durgan, a rancher and Park County Commissioner, “Thats exactly why I said private property. Thats my property. I agree very much what Justin said. If hes got a pivot, he doesnt need those elk down there. Shoot them at any time, really. Hes got cattle that probably needs that feed just as much as those elk do. The Fish & Game Commission, Fish, Wildlife & Parks, have their livestock that they need to take responsibility for, just as ranchers have their livestock that they cant go on forest service land during a certain period, if they have a permit, theyve got to get them out of there, certain period. We understand that and we have to make preparation for that.” (Clearly this group has not heard of the Supreme Court of Montana. 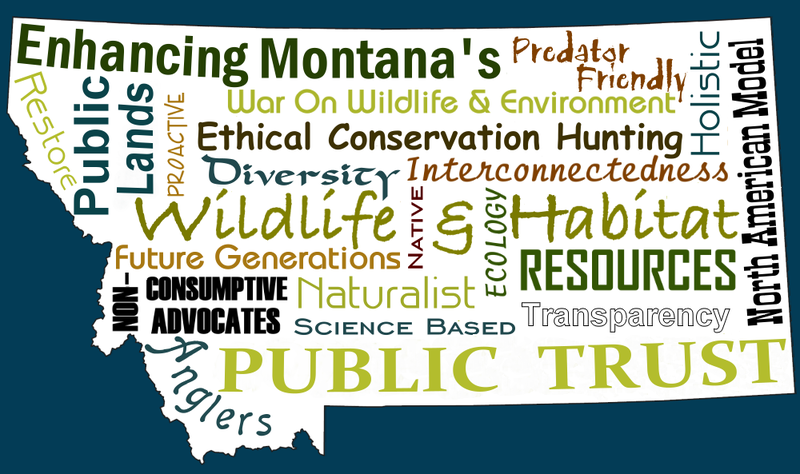 State V. C. R. Rathbone decision, "Montana is one of the few areas in the nation where wild game abounds. It is regarded as one of the greatest of the state's natural resources, as well as the chief attraction for visitors. Wild game existed here long before the coming of man. One who acquires property in Montana does so with notice and knowledge of the presence of wild game and presumably is cognizant of its natural habits. Wild game does not possess the power to distinguish between fructus naturales and fructus industriales, and cannot like domestic animals be controlled through an owner. Accordingly a property owner in this state must recognize the fact that there may be some injury to property or inconvenience from wild game for which there is no recourse." C.R. Rathbone was convicted for shooting an elk, out of season, for eating the grass at his ranch.) Also, WILDLIFE are not livestock, they are just that, WILD LIFE. 1:43:00 – Ryan Malone, “Im going to take a second swing at my first question, just so you carry it all through. Theres leasing situations and stuff. Do you want to have property owner/livestock producer this time around? So youre not limiting? Does that make sense? Because theres people on the ground leasing, from out of state or whomever, that might not be aware of whats going on.” So it was decided livestock owner/or designee. They voted, majority in favor. 1:48:20 – FWP Karen Loveless was asked to explain about the new hunting proposals for Paradise Valley, in certain areas concerned with brucellosis commingling risk, they will have a more liberal season, extend the HD 317 B licenses in the north end of 313, on private land only. Deanne Durgan, Commissioner Jim Durgans wife, states though the public comment period is closed, if this group supported Karen Loveless in that, before the commission, that would maybe help. Druska states, “Concentrating on local hunters for these EMR's would be helpful. Side comments supported this idea. FWP Quentin Kujala mentions that Druska Kinkie has pointed out that landowners with kill permits, already have the ability to identify designees. They vote and Recommendation 3 receives no votes. Then they vote on supporting Karen Loveless hunting proposals to the FWP Commission. Majority apporoved. Please contact the FWP Director, Deputy Director and FWP Commissioners (below) to protest this APHIS/DOL, political, livestock management out of our Montana Elk Management. According to Montana Department of Livestock's State Veterinarian, Dr. Marty Zaluski's testimony, based on the responsible science, "The chance that any one Montana animal (context was cattle) is brucellosis positive is 0.00024%." Not all cases of brucellosis in cattle and domestic bison in Montana (or the other 2 GYA states), since 2008 (when genetics advanced), have been due to elk. Wildlife Management should be based on current, responsible, ethical science; not special interest groups greed, socialized agriculture, politics and the APHIS brucellosis eradication in our wildlife agenda holding the 3 GYA states of Wyoming, Idaho and Montana hostage by forcing them to agree to a Brucellosis Management Plan and Memorandum of Understanding, in order to maintain the Brucellosis Class Free Status. This does not have to be an "us against them" situation. We can have a healthy livestock industry and wildlife managed wildlife in Montana, for the benefit of a stronger, prosperous Montana.